Well the first drawing from the birding/boating trip in Cape May, NJ aboard 'The Osprey' is done, whether I want it to be or not. There's only so much compressed charcoal you can grind into a sheet of paper before the pristine whiteness of the paper disappears forever. That's the case now. Actually I'm very happy with the Short-billed Dowitcher but I do wish I could get back just a wee bit of pristine white paper. I leave it to the viewer to guess where that might be. Though I would rather work from life I just don't have time right now so this is based on a photo. When I chose to begin this work the first thing I asked myself is what medium I should use: charcoal, pastel, watercolor? I eventually chose charcoal. As you can see the way I used it has created a drawing that almost looks like a woodcut. A watercolor would have been much different. I expect that I'll soon also try a watercolor of the same subject, It will be quite different and yet I think both will be true to the subject. That is one of the beauties of art. As promised I've started the first artworks based on the photos taken last week at Cape May, NJ on the 'Osprey'. 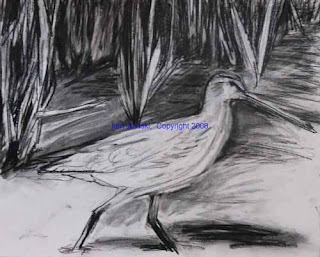 This is the start of a charcoal drawing of a Short-billed Dowitcher. I had done an even earlier stage but the first thing I noticed is that the gesture was completely wrong, and lifeless. 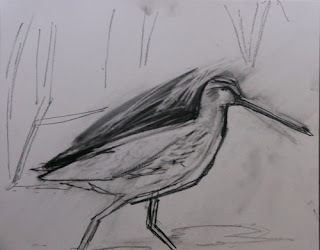 The current version shows some darker, stronger lines meant to simplify the drawing and retrieve a sense of the actual movement of the Dowitcher. 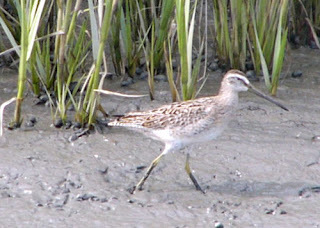 As I work on it I hope to improve the sense of movement, and grace, in the Dowitcher. And eventually there should be a greater sense of the feather pattern. These are truly handsome birds and I hope that the final stage of the drawing will show that. and if you like talking, writing or reading about it, you might very much enjoy this site devoted to The Best Artists. I saw a link to it on another site I enjoy, this one devoted generally to drawing and painting birds and nature, Drawing the Motmot. As anyone who has read this blog knows I do spend a lot of time thinking about art, probably more so than I do about birds and nature. But I think that there is a dearth of discourse on art today. I guess this is somewhat hard to believe given that with the internet and blogs it's unlikely that there is a dearth of discourse on anything! Nonetheless The Best Artists site is refreshing in that it offers the thoughts of one person on one artist or piece of art that they find striking. It's been a pleasure to read, and respond to occasionally. I'd really encourage anyone who has a love of art to take a look. I especially like the fact that it seems free of art historical baggage that obfuscates so much art. This is a straightforward response of one person to the art he sees. Though I've studied Art History, and often enjoyed it, it can have a way of getting in the way of the art, interpreting it for you before you get a chance to interpret it for yourself. In my experience you never truly appreciate art if you don't interpret it for yourself. Art History might augment this but more often it prevents an honest response from the individual. I think this is especially true of the tapes packaged for art exhibits. Their intent may be good but they really disguise the art. It's far better to see an exhibit without any of this, experiencing it for yourself, seeing your own reactions, and then afterwards maybe going back and reading about it or using audio-visual aids. 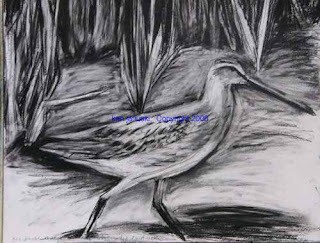 The Best Artists site allows you to read one persons direct observations of art. As I said I find it quite refreshing and enjoyable. 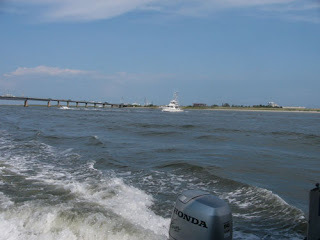 Yesterday, September 13, 2008, we spent a wonderful 2-2 1/2 hours exploring the back bays and sounds of Cape May, NJ on the 'Osprey', a shallow draft pontoon boat captained by Captain David Githens and his assistant Tom. This was part of a trip organized by Schuylkill Center for Environmental Education Bird Club. The SCEE contingent on the boat included 12+ passengers and there were at least 10 other passengers. Most people, including Jerene my wife, spent their time enjoying the ride and viewing the birds. 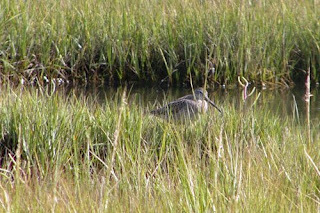 My time was spent between just enjoying being out on the boat on a beautiful, sunny 80 degree day, getting good looks at Short-billed Dowitchers, Black-bellied Plovers, Tri-Colored Herons and Clapper Rails among others, and trying to get photos like those that accompany this post. These photos will be used as the basis for later drawings and/or paintings. I'll elaborate on this post and any artwork that may come of it later, but for now just wanted to get some of this online. 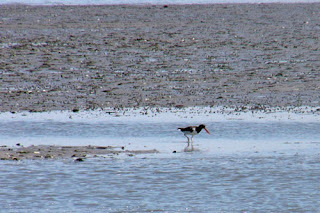 The photos, by the way, include an American Oystercatcher, sandwiched between two Short-billed Dowitchers. The top photo is from the back of the boat as we neared the end of our trip. Though I've spent much of my life near water I've spent very little time on boats. Each time I do I realize how much I enjoy it. Jerene and I spent most of yesterday out birding in Philadelphia. We spent the morning at Carpenter's Woods and the afternoon at Morris Arboretum. One of the surprises of this August has been the discovery that there are a number of migrating warblers, and other migrants, around at this time of year. I'd read that some shorebirds actually start their southern migration as early as late June, but I didn't realize until this year that warblers were also on their way by mid-August or earlier. So I've seen a number of warblers over the last few weeks, most of them at Carpenter's Woods. They include: Blue-Winged, Canada, Black and White, American Redstart, and Common Yellowthroat. Yesterday we added Magnolia, Black-Throated Blue, and Chestnut-Sided at Carpenter's Woods. Despite the famous line about "confusing fall warblers", probably from Peterson's Field Guide to the Birds, we haven't really run into that many difficult fall warblers. Over the last few weeks though, we have run into plenty of confusing fall flycatchers. The main problem is that many of them are neither singing nor calling. No 'peeaweees', 'che-BEK!s', 'PIZZZa!s' or 'FEEBEES' to give a clue. For the most part the birds are silent. 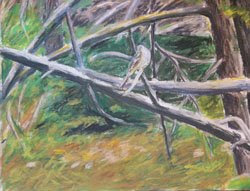 When the view is only from behind, as it was for a flycatcher at Carpenter's Woods last week, is the bird an Eastern Wood-Pewee or an Acadian Flycatcher? Or yesterday at Morris Arboretum, what were the many flycatchers? The huge eye-ring of one, combined with color and tail-flicking, determined it to be a Least Flycatcher. But we didn't hear the familiar 'CheBEK' that used to waken us at Shenandoah National Park. Fortunately the other clues were enough for identification. But what about the other flycatchers we saw: strong white throat, light vest, yellow, lower bill and fine, narrow eye-ring? We finally narrowed it down to Willow/Alder. According to David Sibley first year winter Alder's have a 'distinct but narrow eye-ring'. These two birds both did but were they first year winter birds? I leaned toward calling them Alders due to their fine eye-ring but finally had to just call them Willow/Alder. If only one of them would have called. As for the back view of the Pewee/Acadian I finally decided on Acadian, due to the somewhat oval eye-ring. The next day I came upon another flycatcher at Carpenter's Woods, this time a grayer bird with noticeably longer primary projection. He also flew back to the same perch, like Eastern Wood-Pewees often do. So I decided he was an Eastern Wood Pewee. Then, in an unusual occurrence for August flycatchers, he sang his plaintive 'pawee'. I was thankful to finally have some aural confirmation for my identifications.